The recent couple of warmer days (up to 10 degrees) have brought toads out of hibernation and set them off on their treks to traditional spawning sites. On Saturday 14th March 2015, the first Pat and I saw was crossing the single track road between Glenleraig and Ardvar about 100m from Loch nan Claidhmhnean (NC160318); a male from its comparatively small size (see photograph). The next was also a male, crossing the double track A894 at Kylesku (NC227333), making its way to Lochan Dubh, alongside the road. At least fifteen others, mostly males, had not been so fortunate on this busy stretch of road. 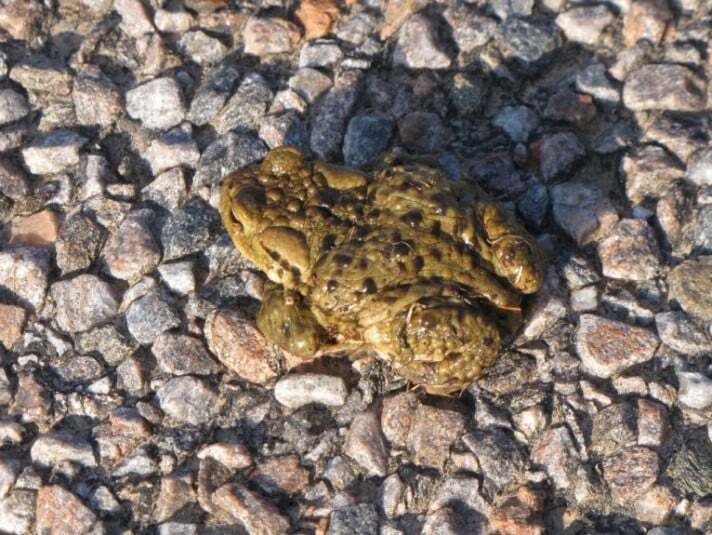 The third was another road casualty, on the single track, near Loch na h-Inghinn at Rientraid (NC188332); it was accompanied by two very flat palmate newts. It is always worth recording any amphibians, alive or dead, that you come across, especially toads, since they may indicate previously unrecorded breeding sites, such as Lochan Dubh. 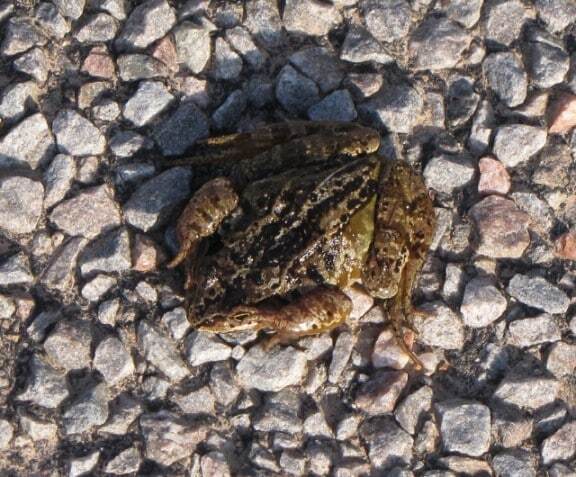 To complete this round-up of Assynt amphibians we found a live frog on the single track just east of the Ardvar access road (NC179326). I had to re-position it for photography and it reacted by covering its eyes with its front feet (see photograph), perhaps to make itself less conspicuous? Finally, John Ross’s garden pond at Nedd (NC137318) now contains over 50 clumps of spawn, the first having been laid on about the 7th of March. Such a concentration suggests that small breeding sites such as this are at something of a premium locally, which is surprising, considering the ditches and puddles frogs choose at times.